Kalvin Phillips has received a two-match ban and will miss Leeds United’s home games against Queens Park Rangers and Brighton after his red card at Fulham on Tuesday night. Phillips was sent off for a second bookable offence in the last minute of normal time at Craven Cottage, his third dismissal of the season and his second in Championship fixtures. The 21-year-old saw red in a recent Under-23s fixture but did not receive a first-team ban for that offence. However, his sending off in a 2-0 defeat at Brighton in December has seen the Football Assocation’s mandatory one-match ban for two yellow cards increased to a two-game suspension. Phillips was making his first league start in two months at Craven Cottage – his reward for an influential performance as a substitute in last week’s 3-1 win over Birmingham City – but earned a red card from referee Lee Probert for a foul on Fulham’s Scott Parker. He had earlier been cautioned for a 50th-minute challenge on Kevin McDonald. Monk expects his options to be strengthend on Saturday by the return of striker Chris Wood from a calf strain, and right-back Luke Ayling is back in contention after missing Leeds’ 1-1 draw at Fulham to be present at the birth of his first child. 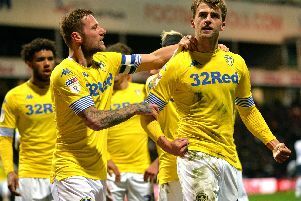 Ayling’s absence allowed left-back Charlie Taylor to make his first appearance since damaging an Achilles tendon before Christmas. Taylor saw out 90 minutes at Craven Cottage and Monk said: “Charlie did well, considering he’s been out for quite a while.